MANILA - Sandiganbayan 1st Division Chairperson Efren De la Cruz and Associate Justice Maria Theresa Dolores Gomez-Estoesta believe that former senator Ramon “Bong” Revilla Jr. is guilty of plunder and should have shared the fate of businesswoman Janet Lim Napoles and his Senate staff Richard Cambe. Napoles and Cambe were found guilty of plunder in connection with the Priority Development Assistance Fund (PDAF) scam and were sentenced to reclusion perpetua. In the dissenting opinions of Gomez-Estoesta and Dela Cruz, it was pointed out that Revilla should not have been acquitted as he conspired with Napoles and Cambe in an intricate scheme of diverting funds from his PDAF through the non-government organizations of Napoles. Dela Cruz, who was the only justice in the 1st Division who saw the start and end of the Revilla plunder trial, stressed that Cambe could not have acted on his own. “Revilla’s designation of Cambe as his authorized representative further proves the prosecution’s contention that Cambe operated under Revilla’s authority, and Revilla was all over the scam scene, although he remained in the shadow,” Dela Cruz said. Gomez-Estoesta also pointed out that courts should be able to detect conspiracy among the accused. “Conspiracy only thrives in secrecy. The PDAF scheme would have gone undetected, absent any positive act to admit to its commission, had it not been detected for the miscalculated slip committed by the grand designer which cut loose one tongue, then another, until all there is to know had been revealed,” Gomez-Estoesta said. While she conceded that the testimonies of whistleblowers Benhur Luy and Merlina Sunas are “not potent” to establish that Revilla authorized Cambe, the other pieces of evidence will prove that Revilla greatly benefited from the scam. She noted, among others, the inquiry report of the Anti-Money Laundering Council which made a financial analysis on the “irrefutable burgeoning wealth” of Revilla. “But taken together with the amalgamation of forces that brought about the conspiracy in the PDAF scam, these facts positively establish that the end-all of the conspiracy is for Senator Revilla to have 50% of the PDAF allocation that only passed through his conspirator, Atty. Cambe, to eventually end up in his bank accounts,” Gomez-Estoesta said. Gomez-Estoesta also pointed out that all the accused, including Revilla, were ordered to return P124 million to the national government in the majority decision. “It only goes to say, therefore, that since all three accused were made to answer for the same liability, the source of the accumulation of wealth as found in the criminal liability should only be the same,” Gomez-Estoesta said. Gomez-Estoesta and Associate Justice Georgina Hidalgo were additional justices who joined the three justices of the 1st division by way of a raffle because a unanimous decision was not reached. The three members of the 1st Division are Division Chairperson Efren Dela Cruz, Associate Justices Geraldine Econg, and Edgardo Caldona. Econg wrote the majority decision of the court which got the concurrence of Caldona and Hidalgo in the special division. The majority decision gave weight to the testimonies of whistleblowers Benhur Luy, Marina Sula, Merlina Sunas, and Mary Arlene Baltazar as to accused Napoles. “They convincingly testified that upon instructions of Napoles, they were able to perform the acts that would execute the plan to convert the PDAF into kickbacks and commissions instead of funding the projects,” the court said. The court also noted that it was Cambe who signed documents, like liquidation letters. “The foregoing indubitably shows that Cambe and Napoles had conspired with each other so that they will benefit from the Revilla PDAF. On the other hand, there is no clear proof that would establish beyond reasonable doubt that Revilla is involved,” the court said. The court also discussed one of the main defenses of Revilla, that his signatures in the pieces of evidence against him were forged. “The court fails to see the hand of Revilla guiding Cambe, Napoles and the JLN staff in the scheme to receive kickbacks or commissions from the PDAF projects,” the court said. 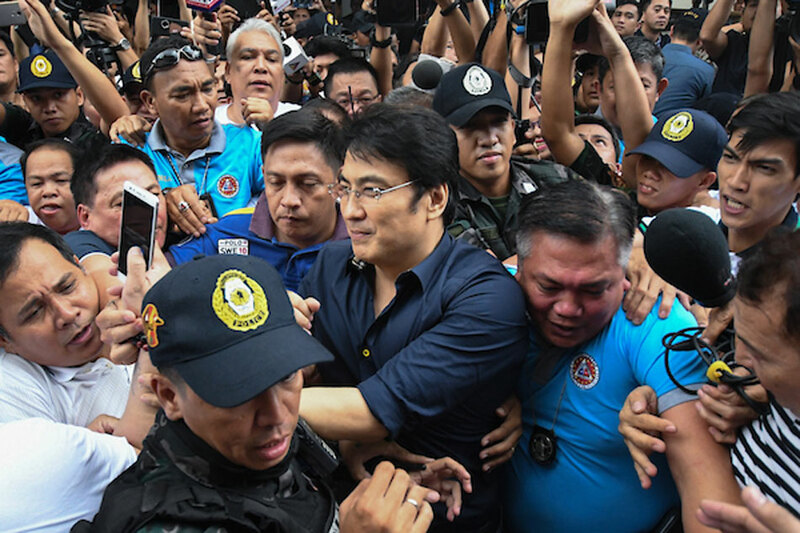 Sandiganbayan divisions usually categorically say if an accused is guilty or not guilty in the dispositive portions of their decisions but in Revilla’s case, it was not mentioned. Revlla was accused of pocketing P224 million kickbacks from his PDAF from 2006 to 2010, in conspiracy with Napoles and Cambe. “For failure of the prosecution to establish beyond reasonable doubt that accused Ramon “Bong” Revilla Jr. received, directly or indirectly the rebates, commission and kickbacks from his PDAF, the court cannot hold him liable for the crime of plunder. Accordingly he is acquitted,” the court said in the decision.